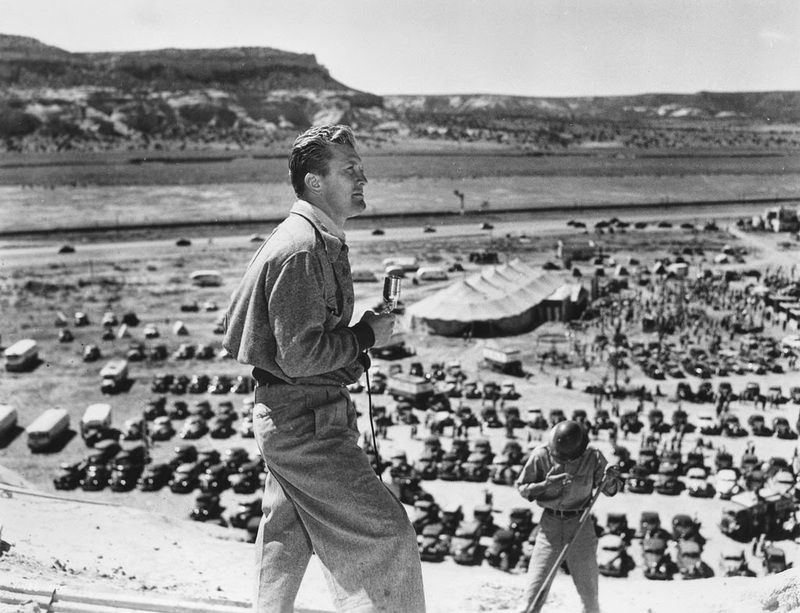 Billy Wilder’s Ace in the Hole (1951) was a failure upon release. Critics hated the way it paints all journalists as either self-serving liars or antiquated men of morality, neither capable of delivering anything important or genuine. 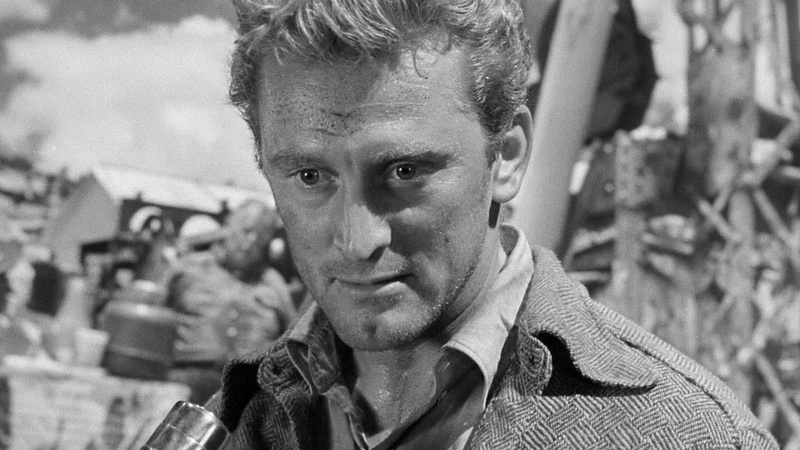 “Bad news sells best,” rebellious big-city newsman Chuck Tatum (Kirk Douglas) tells doe-eyed young photographer Herbie (Robert Arthur), his co-worker at an Albuquerque newspaper operated by Mr. Jacob Q. Boot (Porter Hall), a straight and honest newsman with a needlepoint sign reading “Tell the truth” hung outside his office door. This set is Wilder’s representation of the divided idea of journalism as a necessary and noble profession versus a profiteering product of capitalism. Chuck Tatum is clearly a sensationalist. There are a number of instances where he is heavy on the story and light on the facts, or completely fabricates details as they serve his concept of the story. The entire film watches him control and manipulate a suffering man’s plight for the sake of crafting a national media frenzy, all tailored for Chuck’s personal gain. He brings along Herbie for the ride, taking the once-honest journalism school graduate into his “story first, facts second” process, and even ropes the victim’s wife into his grand design. But in doing so, Wilder makes a point: these “human interest” stories, as Chuck reiterates, are what sell. Chuck’s “Bad news sells best” philosophy may be cynical, but it’s equally accurate. The proof is in how quickly Chuck’s sensationalism turns into the media carnival he imagined, and how simply he is able to mold the information he finds as malleable as putty. That is, perhaps, why Ace in the Hole was such a failure upon release but has grown to be a distinct and beloved entry in Wilder’s filmography. What felt like a caustic attack on mainstream American journalism in 1951 has proven time and again to be accurate, and Wilder’s observation was merely ahead of its time and brazen in its delivery. Now, over 60 years later, we live in an environment of endless messages and information. Content companies are forced to push something upon their audiences with enormous regularity, and quite frankly, there is never going to be enough interesting or necessary material to fill that quota. Chuck Tatum would land a job in a heartbeat at a modern news outlet heavy on sensationalism and light on news. The Wire’s (2002) fifth season looked at this same phenomenon through an Ace in the Hole lens, telling of a Baltimore Sun journalist who fabricated a serial killer to sell papers. Ace in the Hole is self-referential in its own inspiration -- Tatum tells Herbie about the 1925 story by William Burke Miller about a man trapped in a landslide, for which Miller won a Pulitzer. This is the foundation of everything Tatum does. He aspires to that level of renown. How he gets there is irrelevant. Grotesque non-stories litter our news feeds every day, and the truth is that the more disgusting they are, the more they advertise human depravity, the likelier we are to click on them. Chuck isn’t the only one indicted by Wilder’s screenplay -- the entire public clamoring at the foot of the mountain where Leo (Richard Benedict) is trapped are to be blamed. Vendors come in to make a buck off the tragedy, the price of admission to the Indian burial grounds increases every time we’re given a new shot of the entrance, and it isn’t until Leo dies and Chuck takes to the mountaintop where a wide shot reveals the magnitude of what is going on that we truly understand “human interest” at work. The only character who truly gets off without a rap on the knuckles in the film is Leo, having done nothing but dying for the benefit of a news frenzy. The irony of Ace in the Hole is that when Leo finally dies and Chuck comes to his senses, attempting to tell the New York paper how he maligned the story for his own gain and easily committed manslaughter, the editor hangs up. It’s the first real news story of the film, and nobody thinks to pay attention. Ace in the Hole’s cynicism, while applied rather broadly as a condemnation of the journalistic field as a whole, is not incorrect in its suggestion about the way much of the field operates. Today, we truly live in Ace in the Hole’s world, and it is becoming harder to separate the true news stories from the ones given to us by media outlets looking to fill time, get clicks, and sell more advertising space. As print continues to die and television news declines, we’re in a world where digital news is king and the majority of it is self-serving nonsense designed to attract a few seconds of our time and add another hit on the traffic counter.